Product prices and availability are accurate as of 2019-04-04 12:18:53 UTC and are subject to change. Any price and availability information displayed on http://www.amazon.com/ at the time of purchase will apply to the purchase of this product. 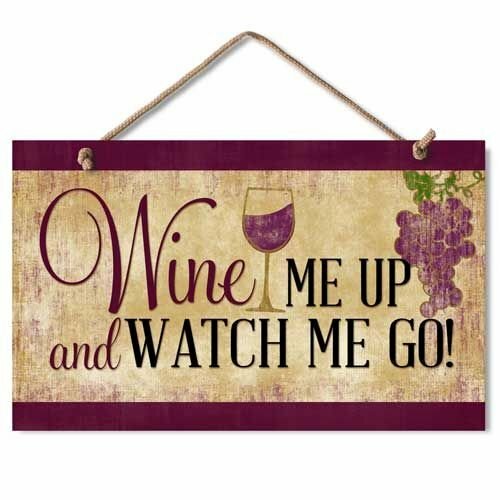 Perfect for kitchens and self-declared winos, this hanging wood plaque features a weathered antique look, wine glass, grapes and reads "Wine Me Up and Watch Me Go!" Compact size means it can be hung just about anywhere. Our wine sign is made from durable wood and measures 9.5 by 5.6 inches. Features a worn, faded vintage look. Easy to hang with the attached rope. USA Made. 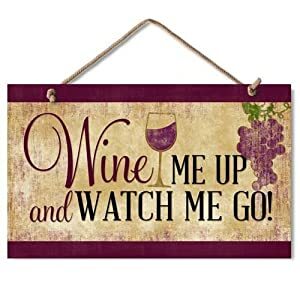 "Wine Me Up and Watch Me Go!" weathered wood plaque 9.5" w x 5.6" h x .25" d Easy to hang with attached rope hanger Great for the kitchen, birthday gifts and vineyards USA Made.